having studied many motor drives I am using two Direct Drives, a completely newly built up Victor T-101 and the Denon 100M, both vintage machines. My belt driven TTs, Continuum, Micro Seiki 5000 with double platter and double motor and the Caeles with two Sperling motors are pretty fine running. The idler drive, EMT R 80, is a beast for itself. So why being interested in another Direct Drive? I know the differences and advantages of the motor concepts. I was quite amazed when being confronted with the new Direct Drive concept of Helmut Brinkmann. Of course it is not new, at least over 10 years old but it comprises a slower, not cogging approach. The latest designs of Technics and VPI still stick to the old design, whenever improved. 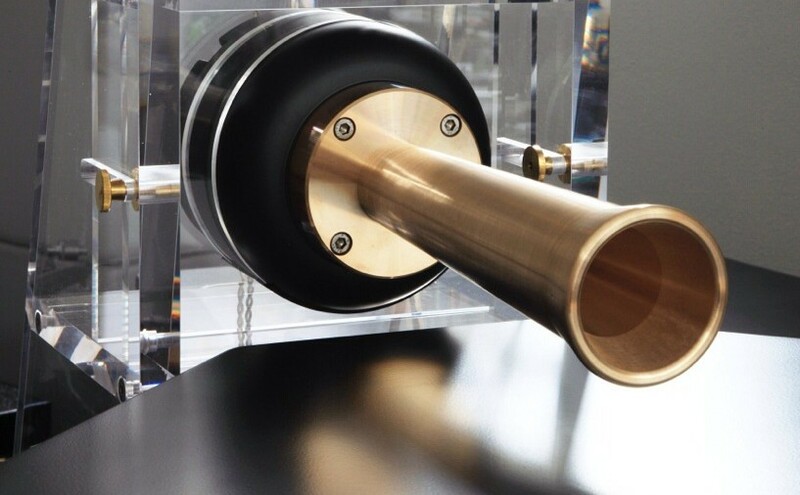 Direct Drive might become a trend in the turntable industry. Astonishingly many users are happy with the concept, not always having a look at belts and different motors etc. With the 10th Anniversary of the Oasis Helmut Brinkmann improved the bearing. It should now be put together by two parts, nevertheless this is usually the case with bearings?! Anyway the 10 kg platter, wearing a built in crystal glass surface, is a pretty intelligent impact in comparison to the light weight platters of other concepts. Brinkmann himself prefers his Breuer modified tonearm, which is not a bad choice at all. I went for the Aquilar, a modern concept of Acoustical Systems which is described on this blog. I should mention that I am using the ART 1000 cartridge of Audio Technica with a 2,1 weight. The silver wire of the Aquilar is prolonged by two Crystal Cable Dreamline Phono wires being connected to the Silvercore transformer and the Boulder 2008 Phono Stage (MM). The platform on which the Oasis is running is a black acryl string design made by the Polish enterprise called pAb. It is smart using the strings for levelling and decoupling. After having tested the unit in my system with different phono stages I believe to have found the best setting to produce a wonderful stable and quiet sound being warm and impulsive at the same time. The power supply is run by tubes too. Whether this is an advantage or not I cannot say as I have not the basic non tube one. In the end the tubes should stay for 10.000 hours. Let ´ s see. The sound is powerful and stable. I really believe that Helmut Brinkmann ´ s development of this Direct Drive design bears many advantages the audiophile world so far has not really recognized. At High End 2019 you should have a look at the Brinkmann showroom. This entry was posted in Allgemein, Turntables. Bookmark the permalink. I agree that this table is something very special in the direct drive world. It is also beautiful to look at! The 22 pound platter provides a flywheel effect when running at speed, something most direct drive turntables avoid with their light weight platters. For me, this set’s the Brinkmann apart from the others. I also feel that it provides the ‘pace-pitch-power’ and impact of idler drive tables with the silence of direct drive mechanism. Thank you. You ´re right. The silence and stableness might be frightening for audiophile friends expecting rumble and noise. I think the perfect finishing of Brinkmann units is part of the price. Just compare the Oasis platter to other tables ´ platters. Brinkmann might use enormous impact on the drilling of the heavy platter. I am not missing the fast start of the other DDs. Maybe in my age patience in this kind of matter might be helpful. You may stop the speed by just putting your finger softly against the outer wand of the platter. No harm to the motor at all!